A little over a week ago, I visited the John F. Kennedy Presidential Library just outside of Boston. There, I was reminded that it was Kennedy who initially wanted to put a man on the moon. He presented this goal at the beginning of the decade, when Peggy Olsen was a secretary, when Don Draper was hanging out with his bohemian girlfriend in Greenwich Village, and when Roger Sterling was puking up oysters. Nobody could have predicted the twists and turns the decade would take at that point—Kennedy’s assassination, Vietnam, the 1968 Democratic Convention, and the beginning of the Nixon presidency. Yet there we were on July 20, 1969, fulfilling Kennedy’s dream (in many ways this event tied the tumultuous decade together). The way we got there was strange, but it happened. Like the times in which they live, Mad Men’s characters’ lives are often unpredictable, but they, like us, can always count on the past morphing into the future without advance notice. Time waits for no man and the future inevitably leaves people behind, and nothing says “the future” quite like the wide open possibilities of space. More than anything, ‘Waterloo’ feels like an ending. Torches are being passed all over the place in this episode. I guess it’s fitting that Bert Cooper died right after Neil Armstrong set foot on the moon—he always loved astronauts (remember his eulogy for Ms. Blankenship in season four?). But Bert also represents the last of an old generation that has faded away. He was someone who Don and Roger looked up to, now they take their place as the next in line to kick the bucket. When Bert told Roger that he wasn’t a leader, it seemed to shake Roger from his eternal childhood trance. This led to the McCann deal, which seems like it will lead to the sale of Bert’s company mere days after his death. Like I said, the future often ruthlessly replaces the past without warning. Time waits for no man. In many ways, Jim Cutler represents this relentless rush toward the future more than anyone else on the show. He’s one part stone cold pragmatist and one part villain, and his attempt to oust Don from the agency leads to another great torch-passing moment in this episode. With Don’s job hanging in the balance, he decides to hand the Burger Chef pitch over to Peggy at the last second. It seems like Don’s really letting go and realizing that other people need to fill the shoes that he once filled. The agency really is just one big ecosystem where some people die out or move on while others move up the food chain and assume their positions like it’s a law of nature (In this way, the Mad Men world reminds me of the streets on The Wire). Peggy proves that she’s more than ready for the moment here. Her pitch is so good that it harkens back to Don’s famous carousel speech in ‘The Wheel.’ Was there any doubt that SC&P was going to pick up Burger Chef’s business after that? I’m pretty sure I even saw a tear beginning to form in one of its executives’ eyes as Peggy was wrapping things up. 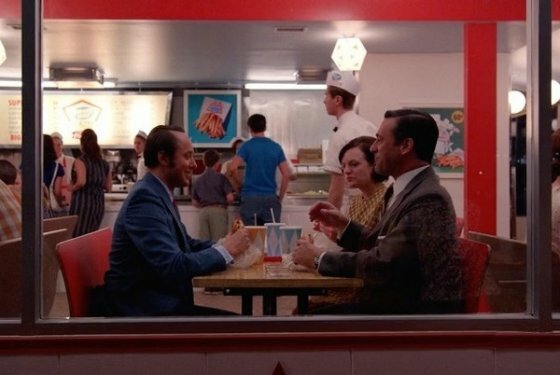 One of the best things about this half season of Mad Men has been the way Don and Peggy have mended their relationship. It has been well documented that one thing that may truly “save” Don going forward is his role as a mentor and friend to Peggy. Finally, there’s the deal with McCann Erickson. This plot point sets up so many interesting questions for the final seven episodes of the series. It certainly creates an existential crisis for Don. He has had various opportunities to work at McCann, literally since season one, and has always been deeply unimpressed by the opportunity to work for such a huge agency where he’d be just a cog in a machine. However, I think the first couple episodes of this season showed us that Don really needs to be in the business or he loses his sense of purpose (he even tells Ted as much in this episode). The fact that his relationship with Megan seems to be beyond repair only serves to further drive this point home (side note: I don’t think Don and Megan will ever officially get divorced, at least on the show. They’ll just remain separated and very distant). At the end of the day, selling the agency to McCann will make all the partners very rich, but will it make them happy? Will they still have purpose? In several interviews, Matthew Weiner has said that he intended for the first half of this season to be about the material world and the second half to be about things beyond the material world, such as happiness, spirituality, and personal fulfillment. With this in mind, it seems that Don’s vision of Bert Cooper’s bizarre dance routine was a strangely appropriate way to lead us into the show’s homestretch. “The best things in life are free,” Bert sings. We hear this a lot, but what will it mean for these characters, as we prepare to leave them forever next spring? I can confidently say that I have no idea, but I can’t wait to find out. In closing, I want to thank everyone who has read my posts this season. I’ve had fun writing these, and I hope that I’ll be able to write recaps for the final seven episodes of this great show in the Spring of 2015. I’d also like to thank Colin for agreeing to post my recaps on his blog every Monday. Whenever he gets a free second at work on Monday mornings he’s making sure that things look good and that they’re ready to post. Without his hard work I’d just be a guy sitting at a computer.